The Kiwi is also known as the Gooseberry. 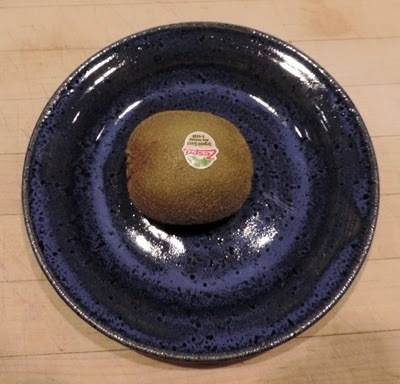 Almost all kiwifruit sold belong to the Haywood variety and has a fuzzy, dull-brown skin, and bright-green flesh. Packed with more vitamin C than an equivalent amount of orange, the bright green flesh of the kiwifruit speckled with tiny black seeds adds a dramatic tropical flair to any fruit salad. It is a small fruit approximately 3 inches long and weighing about four ounces. Its green flesh is almost creamy in consistency with an invigorating taste reminiscent of strawberries, melons and bananas, yet with its own unique sweet flavor. At approximately 42 calories, Oma finds the Kiwifruit a healthy yet tasty snack! Like avocados and bananas, kiwifruit contain substances called compounds that are associated with the latex-fruit allergy syndrome. There is strong evidence of the cross-reaction between latex and these foods.